While the strain on the neck may be an unavoidable drawback to the job, neck pain doesn’t need to be. Leaning over a desk to work on your clients’ hands is a prescription for neck pain. The strain on the muscles from extended hours of work will eventually take its toll on your body. While the strain on the neck may be an unavoidable drawback to the job, neck pain doesn’t need to be. Stretching regularly throughout the day will reduce muscle strain and relieve the tension that builds in the soft tissue. Symptoms of neck pain include a dull headache, achy muscles, and a tightness in the neck and shoulders. Severe cases may include a sharp, throbbing pain. Problems originating in the neck could cause ringing in the ears, dizziness, and numbness or tingling in the hands. The physical requirements of a nail tech make it impossible to work without bending over for hours at a time. Improper posture, prolonged periods of sitting, and holding the neck in an extended position all strain the muscles of the neck. Neck pain can also be caused by sleeping in an odd position, stress, or injury. The strain on the neck may also aggravate problems that started in the neck from much earlier in life; for example, early childhood falls, fender benders, or sports injuries. Neck pain can be greatly reduced by stretching frequently throughout the day. 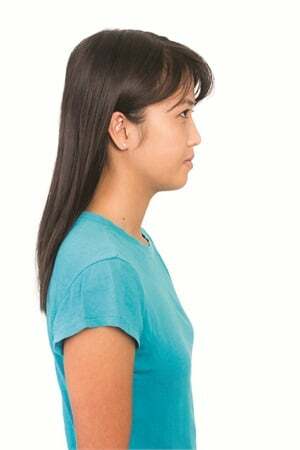 Perform simple neck stretches immediately upon rising, then incorporate stretches into your routine throughout the day. Sitting back in a chair and letting the neck extend backward over the edge of the chair for a few minutes is a simple movement that can counteract the stress placed on the neck that’s been flexed forward for hours at a time. Reduce inflammation by placing a towel-wrapped ice pack on the neck for 10-15 minutes a day. Heat draws blood to inflamed areas, which further irritates muscles and nerves that are already aggravated. Massage, even self-massage, is an excellent aide in the relief of sore muscles. Body massagers, such as Brookstone’s “iNeed Neck and Shoulder Pro,” offer deep massage in hard-to-reach areas and allow the tech to relax while the area is massaged. Stand with your shoulders straight. Breathe freely. Lower your chin to your chest. Hold for 15 seconds, allowing the tension to release. Relax, and slowly raise your chin to the upright position. For simple neck pain caused from a typical day’s work, medical intervention is not necessary. Pain relievers or muscle relaxers may remove the immediate discomfort of a sore neck, but resist the urge to turn to a pill for a solution. The answer is to care for your body in response to the requirements you’ve put on it all day. If you suspect the pain has a cause beyond the demands of the job, consult a chiropractor. In addition to spinal adjustments, a chiropractor may recommend physical therapy or acupuncture. Three types of surgery may provide relief for neck pain caused by herniated disks: discectomy, fusion, or artificial disc replacement. However, all types of surgery are dangerous and have the possibility of failure. Look for non-invasive solutions before considering drugs, which mask pain (your body’s signal that something is wrong), or surgery, which permanently alters your body’s ability to heal itself. This article is not intended to replace the advice of a doctor.